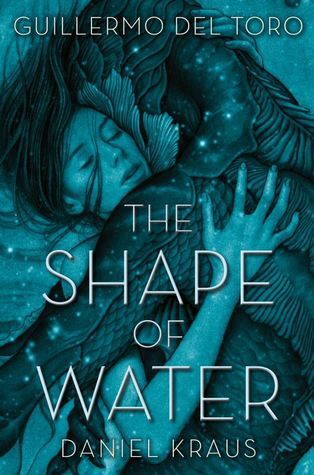 Described as one half of a “bold two-tiered release”, The Shape of Water is the companion novel to the Guillermo del Toro film of the same name. But what exactly does this mean? Curiosity piqued, I decided to do some digging around, and found out that the idea for a story about a mute woman falling in love with an imprisoned river monster actually came to author Daniel Kraus when he was a teenager. In the years that followed, he continued to incubate the concept, until a meeting with del Toro became the spark that motivated Kraus to finally write the novel. The director also expressed interest in turning the idea into a movie, and so, both projects went forward at the same time while the two creators kept in touch. Eventually though, Kraus decided he wanted to finish his book without knowing any more about the film, so at that point both author and director agreed to each proceed with their own individual interpretation of the story. As a result, while there are many similarities between the movie and novel, there are quite a few differences as well. The key elements, however, are the same: the setting is 1962 Baltimore, at the height of the Cold War; the protagonist is Elisa Esposito, a woman who has been mute her whole life; and the conflict begins when Elisa, working as a night janitor at the Occam Aerospace Research Center, meets and falls in love with the laboratory’s top secret asset—an amphibious man captured from the Amazon. From the moment Elisa first laid eyes on him, she was enraptured by his terrifying beauty. He was worshipped as a god where he came from, but now he is a prisoner and an experiment to be studied for Cold War advancements. Day after day, he is tormented by Richard Strickland, the soldier who spent nearly two years hunting rumors of a “fish man” through the South American rainforest before he finally caught up with his prey. At the research center, Elisa is the only person who shows the creature any kind of compassion, secretly teaching him sign language so the two of them can communicate. Later, when Strickland’s plans to dissect the amphibious man come to light, Elisa and her friends risk everything to save her beloved with the help of an impassioned scientist who is also an undercover Russian spy. I opted to watch the movie before tackling this book—a decision I’m glad I made, because I think it helped me understand and appreciate the story more fully once I experienced both mediums in this order. There are differences between them, but not really so much that calling this one a novelization would be wholly inaccurate, since after all, both film and book follow the same basic plotline and events. And yet, what I got here also turned out to be much more than what I watched on screen. One major difference comes to light right off the bat, with the book opening on Strickland’s POV as he makes his trek through the Amazon jungle trying to capture the river creature. The novel definitely gives us a more well-rounded picture of the story’s villain—not enough to get us to truly sympathize with him perhaps, but these early chapters do go a long way in explaining why he might be so messed up. The second major difference in the book version is the subplot involving Strickland’s wife Lanie, whose character was almost a non-entity in the film. In contrast, she is a powerful presence in the novel, her sections adding a great deal of depth to the story by expanding the narrative beyond the events taking place at Occam. Other than that, the characters and their roles are generally very similar between both versions. Readers do get to enjoy a few extra perks in prose form, however, namely being able to get into the heads of the characters, thus gaining more insight into their thoughts and emotions. Supporting personalities like Zelda, Giles, and Mr. Hoffstetler were all better developed, and once or twice, we even get brief glimpses into the mind of the amphibian man himself. Since neither he nor Elisa could speak in the film, audiences were limited with regards to the interpretion of what the characters were thinking or feeling, but this was obviously not an issue in the book where readers were actually able to experience the story from their perspectives. The writing was also beautiful, and there were definitely a few scenes in this tale where only the written format could do them justice. Unfortunately, those were not the love scenes, which, as some other reviewers have already pointed out, were dismally bad. To be fair though, I was never too keen on the romance to begin with; Elisa’s character always struck me as too guileless and practically childlike, while the narrative kept driving home the point that the creature was at his core an animal. With these images in mind, thinking about the two of them together simply became a little too disturbing and off-putting. Still, narratively speaking, overall The Shape of Water was a fascinating and worthwhile journey. Although I was unable to enjoy the romance on an emotional level, I nonetheless felt a connection with many of the characters, and the premise itself appealed to my sense of wonder and imagination. I would highly recommend this book if you enjoy character-driven stories with a touch of the uncanny and fantastical, or if you are interested in the subgenre many have come to describe as fairy tales for the modern age. Audiobook Comments: I was quite impressed with the narration by Jenna Lamia, whose lilting voice made for a good fit with this novel. She brought the tale to life with her pitch-perfect tones, accents, and inflections, adding another layer of personality to the characters. It made for a very rich and enjoyable listening experience. I’ve been debating this book for the past two weeks. i like your review, maybe i’ll pick it up next. I love that you reviewed the book and the movie. Because of its unexpected Oscar win, I’m dying to see the movie now, and I’m glad the book earned 4 stars from you! I’m curious about the romance, it seems like it would work for me, but we’ll see! I must admit that I’m not greatly keen to read the book or watch the film, but I enjoyed your review! The movie was okay, I thought. I think I actually prefer the book! Yeah, at first I just thought the book was a straight up novelization, but then I discovered the cool story behind the two creators. I thought it was interesting! If you can pick up the audio, it’s worth it! The two are generally the same, I think reading the book gave you more supplementary info though! Thank you so much for explaining the relation to the movie. I was confused about it, and it makes perfect sense now. I was confused too, to be honest. It felt like a straight up novelization to me, at first, with the addition of some extra scenes/info. But then I read about how both book and movie came to be, and I finally understood why they were so alike, and why some little things differed! I’d read the book first 😁. You made it sound really interesting with the movie connection. Also reminded me of this russian book, Amphibian Man. Haven’t read it, but we had it in the family library. I would be curious to know how reading the book first, then watching the movie would be like! I’m glad that you recommend watching the movie first (because I really do want to watch it haha), but the book sounds quite good as well. I like how you outlined the pros and cons here, like how the book gives us more insight into the villain and the characters communicating to one another. Terrific review! Yeah, I’d wanted to watch the movie forever! But I didn’t get to it until I got the audiobook to review. I went back and forth, but finally decided to watch the film first over the book, and I’m glad I did!